In the age of tiny homes, there’s a lot of momentum around the minimalist home movement. Every single nook and cranny of a tiny home features storage options and multi-purpose functions. After all, when your home is less than 1,000 square feet, you have to get creative. While modular homes have bigger floor plans and thankfully don’t require a bedroom that also functions as a kitchen and bathroom, they can still benefit from the tiny home mentality. At Cannon Homes Inc., we’ve seen some innovative and effective ways to save space over the years. We’ve compiled our favorite tips for creating a spacious modular home. If you’re looking for a modular home in Illinois, call our Top Rated Local® modular homes manufacturer in Marion. This suggestion might seem like a cop-out — save space by adding more space to a modular home? We know this isn’t totally helpful if you’ve already purchased a modular home, but certainly take note of this tip if you’re in the market for a manufactured home. Basements in modular homes serve the same exact function as ones in regular homes. They can store all the old memories you want to keep but don’t necessarily want to display in your living room. They house holiday decorations in the off-season and old kitchen supplies you’re waiting to send to your daughter. Basements practically double the square footage of your home, so you get a sizable difference when it comes to storage. For modular homes with basement floor plan options, check out our modular homes on display! The spaces behind doors are some of the most underused aspects of a home. You might already hang a shoe rack over your closet door, but have you thought about adding these storage contraptions to other doors in your home? In your pantry, for instance, hanging racks can store cans, jars, seasoning, and practically anything with a lid. You could also store cleaning supplies in this manner as well. If you’re really tight on space or just like innovative home decor, also consider hanging a shoe rack on a curtain rod. Now, you get extra storage and a curtain. We recommend storing miscellaneous supplies in this type of shoe rack, as it might look strange to have all of your snacks out on display in the living room. 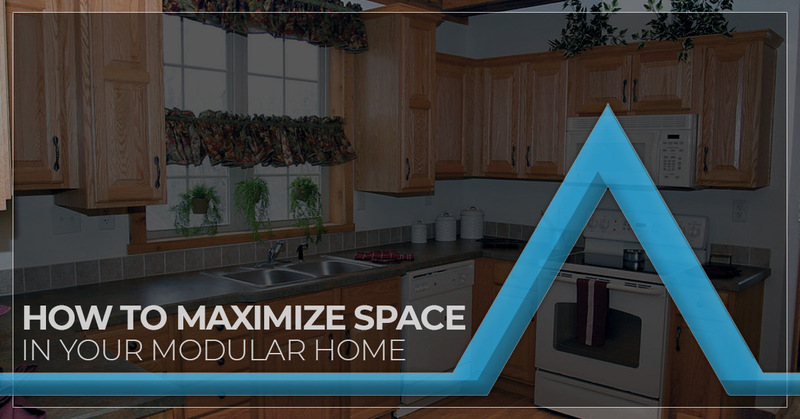 Luckily, modular home manufacturers understand the importance of maximizing space in a manufactured home. If you want to purchase a manufactured home, be sure to look for these built-in design features. Again, if you know space is going to be a concern, just ask your manufactured home builder about their space-saving design options. Ottomans are like the jack-of-all-trades when it comes to home furniture and storage. Ottomans can function as an additional seating option, coffee table, bench, or entertainment shelf. For maximum space-saving, be sure to purchase an ottoman that has built-in storage. Here, you can store books, shoes, entertainment items, extra bedding, or anything else for which you don’t have a space. We think of ottomans as exclusive living room options, but they can really be practical for any room of the house. Having an ottoman at the foot of your bed, for example, can provide extra storage for blankets, pillows, reading material, or bulky winter sweaters. For the Top Rated Local® modular homes in Marion and all of Southern Illinois, contact Cannon Homes Inc. today!